What do slouching, back pain, and a middling forehand or weak shot off the tee have in common? Often it’s a weak core—the girdle of muscles, bones, and joints that links your upper and lower body. Your core gives you stability and helps power the moves you make every day. Whether it’s bending to pick up a laundry basket, swinging a golf club, paddling a kayak, or reaching to pull a vase from the top shelf of a cabinet, a strong and flexible core makes the move more fluid, efficient, and robust. Strong, well-balanced core muscles can also improve your posture and help prevent back injuries. And if back pain does strike, core exercises are usually part of the rehab regimen. 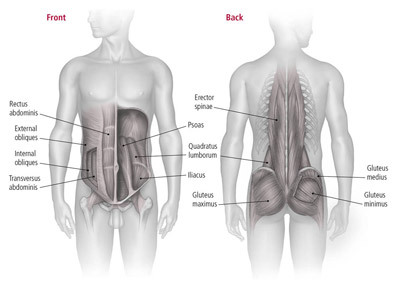 Your core is composed of many different muscles in the abdomen, back, sides, pelvis, and buttocks. These muscles work together to allow you to bend, twist, rotate, and stand upright. 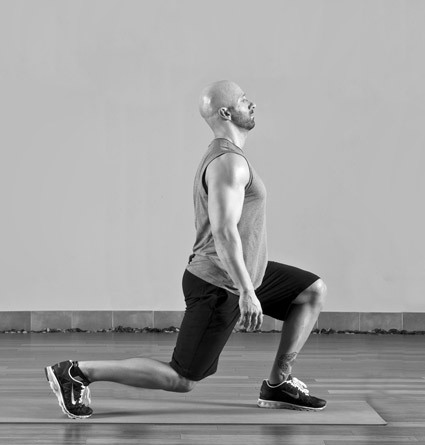 Lunges, squats, and planks (a move that looks a bit like a push-up and is often substituted for sit-ups) are key moves in most good core workouts. Sit-ups and crunches—once the bread and butter of core work—have fallen out of favor in recent years. Why? They can actually cause back pain, partly by focusing only on abdominal muscles. 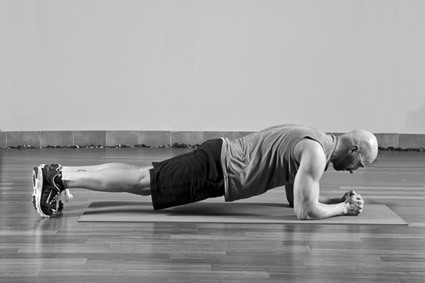 Exercises like planks efficiently work many more core muscles at once. So whether you’re launching into your first core workout or have been planking, lunging, and squatting your way to a tightly toned core for quite some time, reviewing the right—and wrong—ways to do these three fundamental moves is worthwhile. Core Exercises: 6 workouts to tighten your abs, strengthen your back, and improve balance is available from Harvard Health Publishing. You can read an excerpt here from the report with tips on checking and improving your posture. Shoulders are aligned directly over the elbows. Body is properly aligned so that neck and spine are neutral. Model is looking down at the floor. Shoulders are down and back. Only toes, forearms, and hands are touching the floor. Torso sags toward the floor. Only toes, forearms, and hands should be touching the floor. Neck and spine are not in a straight line. Knees, hips, and toes are pointing forward. Buttocks stay above knee level. Knees aren’t extending beyond toes. Back is neutral, not arched. Feet and knees are pointing straight ahead. Shoulders, hips, and knees are even. Abdominal muscles are pulled in. Back is arched, and chest isn’t lifted. Knees extend beyond her toes. Knees and toes are turned in. Knee of the forward leg is aligned with the ankle. Heel of the rear leg is lifted off the floor. Back knee bends enough to form a straight line from shoulder to hip to knee. Shoulders and hips are even. Body is slouching forward, not upright. Knee is not properly bent to form a straight line from shoulders to knees to hips. Back is curved and head is lifted. much for your contribution in this. sporting goods stores to buy some equipment in sport. Wow, thank you very much, I’m looking for sports equipment, best sports books I could use for my daily exercise schedule and this blog of yours really help. Excellent blog, by the way do you have available sports books, perhaps you could compile these exercises and for sure this is going to be the best sports books. Many thanks for your post. Many celebrities are big fans of elliptical trainers. Jennifer Aniston swears by her elliptical trainer. She uses an elliptical trainer for 20 minutes every day. I liked the exercise #2 to do so i felt a great relief in my back, thank you for these exercises, worked for me. These are good techniques of maintaining physique of your body. Thank you. Excellent to address to a big problem. Much more needed on proper alignment and integrating strength trajectories naturally. My criticism is that even the “good” postures aren’t good enough especially in the squat & lunge. The head and neck alignment is too tense and by activating so many unnecessary muscles in the upper body it takes effectiveness away from the central stabilizing muscles. Traditional Chinese martial arts like Tai Chi have focused on the center (tan tien) as being the sources of natural and efficient use of strength and avoiding injury. Although much caution is needed for the general population to progress very slowly with knee bending. Good Tai Chi focuses on balance, healthy aging, relaxation therapy and the appropriate intensity of exercise for the individuals personal needs. Excellent post, thanks. I agree with all you say – a strong core is the basis of everything! One way to achieve that, in addition to benefiting from cardio training, is to use an elliptical trainer. An elliptical takes the strain off the joints whilst exercising both the upper and lower body and ensuring good posture. There are dozens of excellent elliptical trainers on the market by top brands such as Sole and Nautilus. Thanks for this post.The information here is excellent and the pictures are very helpful! I’ve always been TERRIBLE at doing squats and that’s probably why I never want to do them when I work out. Thanks for the info on proper form. I’ll try to start applying this when I’m in the gym. This is a very helpful post. I will share these ideas with my readers on my blog. I am sure they will appreciate the tips. Thanks. The contents of this site is wonderful, where you can find your favorite and you want. As a Yoga teacher and ex-actor (I broke my back on stage Before I studied for my Yoga teacher training) core strenght and balance have always been an issue for me. These exercises you’re showing are almost exactly the same as those we do in our daily yoga practice which is over 1,000 years old. The photographs you’ve provided could be more accurate. In all three shots they should have the tailbone tucked in to lessen the lowerback compression. This is exceptionally important… In the third shot the guy is compressing at the top of his spine by tilting back the head. These will cause problems by damaging the discs of the spine and possibly cause extra wear and tear to the spine. Posture is everything. The biggest mistake I see moms making is believing they can neglect core exercises and just do cardio. This blows that assumption out of the water. Thank you for this fantastic information. My bootcamp clients need constant education on why ab exercises is one of the worst ways to strengthen the core, and your informative report breaks down those barriers. The abdominal muscle is the place where you want to shed the fat and build muscle. It is extremely hard to do and requires a little hard work. The squat is a great exercise for total body fitness but if done improperly, which so many do, it can lead to many problems with knees, and your back. I’m not sure about your argument. I have a poor forehand but very good core body strength! I do my home workouts and also go to the gym, play tennis, do yoga and pretty much take care of myself well. But I still can’t hit a good forehand to save my life. perhaps it’s technique that’s letting me down because it’s not my workouts at home that’s for sure! Thanks for this post.The information you have provided is excellent and pictures you have have provided is amazing! Awesome example of these important exercises. If you have a strong core, your performance will be better in any sport you are involved in! Awesome tips about exercise. Thanks for sharing tips on how to strengthen core. I’ll definitely add your tips on my next workout. Thanks a lot! Motivational weight loss quotes can actually inspire you to stay on your diet for a longer period of time–and isn’t that what it’s all about – finding something to help you stick with it until the job is finished? Very useful and informative site, but some commentators controversial statements. However, the information is very useful for readers post. Your blog is great for anyone who wants to understand this subject more. The amount of information in here is stunning. Thank you. Great article. Another core exercise I’ve learned is having a newborn baby…and bending over 10 to 12 times a day changing a diaper. Oh man! It’s a good/bad workout on the core. Workout is beneficial if you do it in the right way. Therefore I always listen to professional workout trainer’s suggestion before trying on various exercises. If it is not convenient to find trainer some of the best workout dvds are also helpful, since they summarize the main points on how to improve your health and fitness level. I suggest reading a book like Starting Strength by Mark Rippetoe where he talks about how to perform exercises correctly and gives a great routine to workout. I guess finding useful, reibllae information on the internet isn’t hopeless after all. I believe that keeping a neutral or arched back is the key to never getting a back injury–and also not twisting the torso when picking up something. It is possible to get a back injury even when you have a strong core. I know because that was what happened to me some while back. My stomach muscles were like steel in that I was able to do about 70 situps in a minute. I was in a job in which I lifted a heavy back of garbage with bad form and then sprained my back. The spasms kept me from walking for days. Develop a strong core and use perfect form (arched back) when lifting. That is the most important thing. Awesome blog! I love how you show both the correct form as well as the incorrect form. I find it very difficult to teach some people how to really get a good [URL removed by moderator] Core Workout. THANKS! Basic but good Annmarie Dadoly. My belly button has a little hernia that will be operated this week. Doctor says no exercise for a month! I think a little exercise will be fine. Core exercises are fantastic for anyone looking to rebuild their strength following injury or illness. You are correct about core exercises about playing a role in rehab. At our physical therapy clinic, Pilates is use to help strengthen the core and teach proper form for exercising. In agreement with the previous comments about the benefits of this posts in helping to avoid injury. One of the keys of core exercises to perform them correctly is to keep the spine in alignment. Thanks for this post. We see so many injuries from people who try to workout and get in shape, but are doing it all wrong. Ultimately, that only leads to giving up on their fitness goals. Form is vital to injury prevention, many of the sports injuries we see are precursor-ed by bad form during exercise. Exellent information and clear great pictures to demonstrate.